Walker’s latest wordless novel introduces a measure of silence to one of the most outspoken and talked-about figures in modern Canadian history. The Life and Times of Conrad Black documents the eventful life of the Canadian-born media baron, from his earliest childhood influences, to his rise to power at the helm of Hollinger International, his membership in the British peerage, and the ruin of his business and his good name after being convicted of fraud. 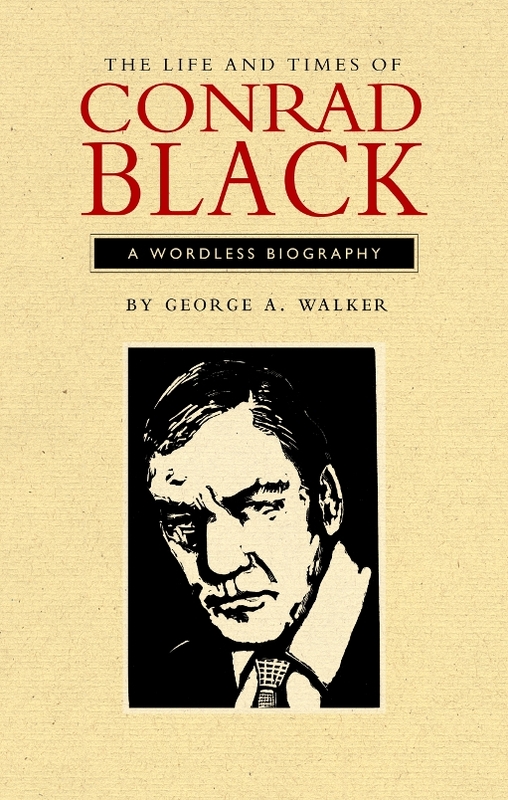 Stripped of the facts and circumstances but roughly ordered chronologically according key milestones in Black’s life, Walker conveys meaning not through verbal allegation, but through visual implication, presenting a unique perspective of Black’s life and the conditions that shaped it. George A. Walker’s The Life and Times of Conrad Black: A Wordless Biography is a curious specimen of a book. It is comprised entirely of woodcut images, without text of any kind, and it provokes a very different response than biography normally does. Most biographies provide information to satisfy our curiosity in a particular life, but Walker presents us with images that offer little concrete information about the life of Conrad Black. Instead we have to rely on our own memories of the events he depicts, or we have to investigate the images that we do not recognize at all. In this way the book’s biographical information is primarily what we bring to it, what we are able to remember or are willing to discover. The images direct us outward, encouraging us to reconsider the subject of Black’s life on our own. By eschewing words, Walker’s woodcuts are allowed to stand as simple and powerful gestures to a life story that any amount of words would be unable to tell in any case. His interpretation of Black’s infamous middle finger is wonderful, as is the effect produced by a seemingly stray halo in a depiction of Black defending himself to the world. These images are, as Tom Smart’s closing essay suggests, a kind of text in themselves, and they tell a story that is truly compelling, even and especially if it is a story that requires us to contribute more than usual to its telling.